With water becoming a valuable resource, the future is storing water on site for irrigation purposes. Metered water is becoming common, and is already in effect in the District of West Vancouver. Environmental concerns regarding water usage have caused municipalities to enforce watering restrictions. One action that can be taken is to install a large plastic tank or cistern to collect rainwater and store it for future usage. Perimeter Drainage Ltd can install a cistern tank underground and can be used to water your property on demand, and without regulations. These tanks are connected to your storm water system and will store water during rainy days. 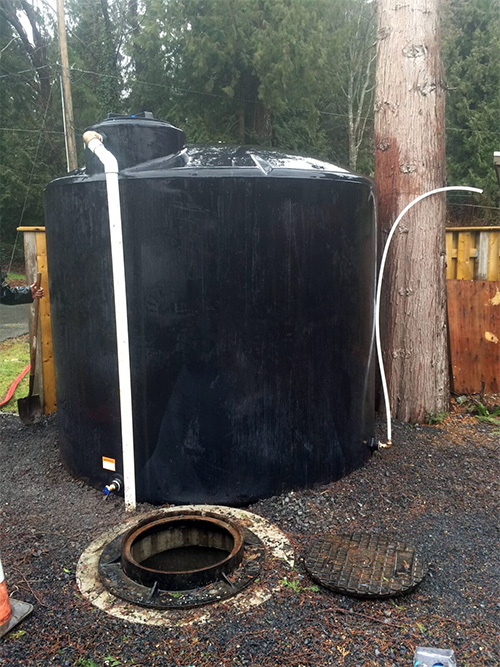 Tanks range in size from 600 gallons up to 10,000 gallons. Each tank would be specifically designed for your application. Turn on your pump and stored water can be used for irrigation and it is free to fill up. Just wait for rain. Save money on your metering and reuse, reduce and recycle. Call Perimeter Drainage Ltd for an onsite consultation.